NOTE: The Modeler is an application that has not been maintained for a long time. Few issues has been reported in the SOFA forum. In a near future, the Modeler will be updated. What is the Modeler ? 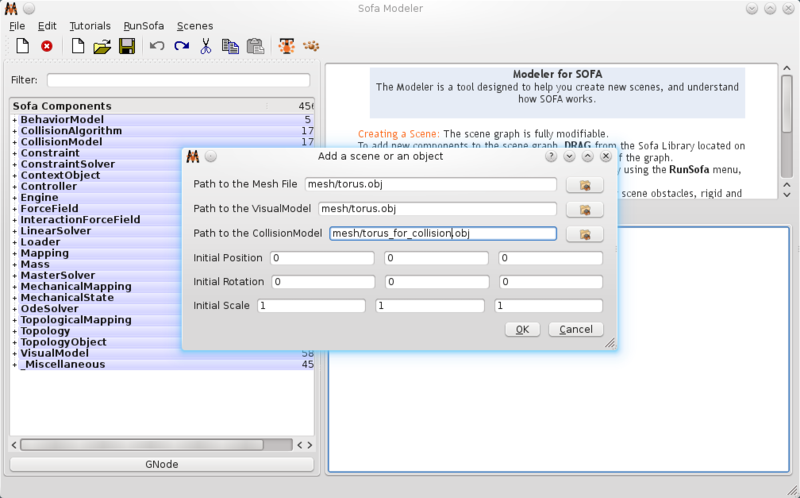 The Modeler is a graphic tool using Qt, designed to ease the creation of scenes for Sofa, and also to provide information of all the contents available, and how to use them. 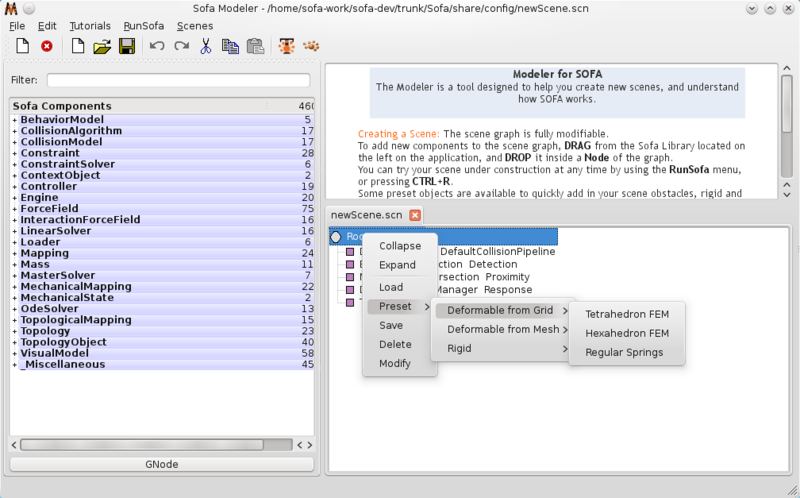 It allows you to dynamically create/remove/configure components inside the Sofa scene graph, and launch the Sofa application to see directly what behaviour you get. 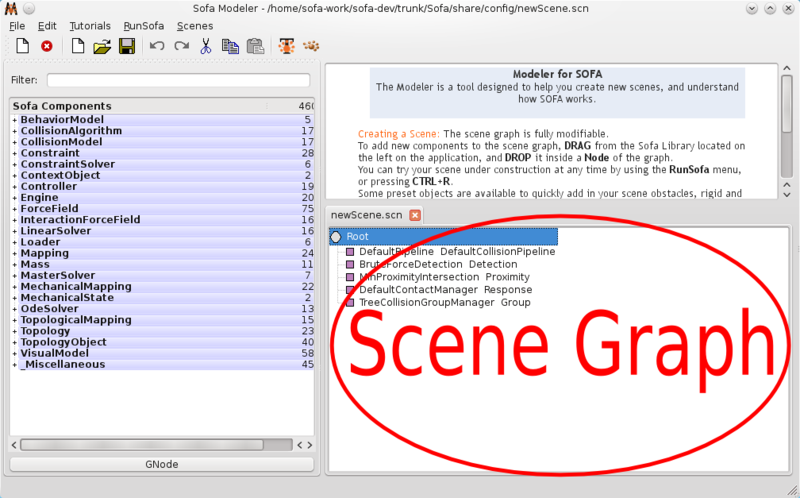 Once you are satisfied, you can save your scene graph to a xml file, and use it later within Sofa. Presets: this is one of the most useful feature, we’ll go more into details later, but basically, it allows someone with absolutly no knowledge of Sofa to create a deformable/rigid body using a 3D mesh, in only 3 clicks! Filter the components using a keyword: entering the text Triangle in the filter zone will reduce the library to the only components containing the word Triangle in their name. some examples scenes. They are displayed as links, by clicking on them, you directly open them inside the Modeler: simply press CTRL+R and you test the scene. Each component of the library is a button: by drag&dropping them in a node of the scene graph, you actually add it to the simulation. If you drop above a component, it will be placed above this component. Error detection: errors on template are automatically detected and displayed to the user. 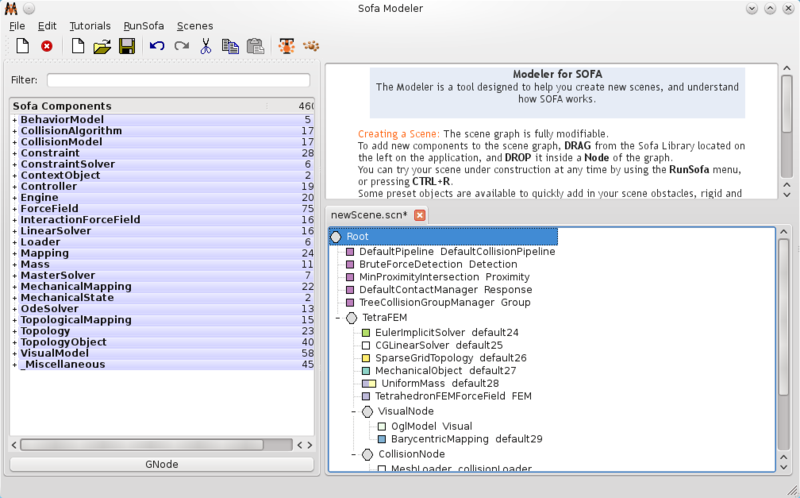 The goal of the Modeler is to turn you ACTIVE in the understanding of Sofa. Try any scene you want, modify the components, add some, delete others, then CTRL+R, and you try it in SOFA. You don’t need anymore to know by heart the name of all the components, and their parameters, just drag&drop them from the library to the scene graph, and edit them. This can be done, just like inside the SOFA main application by double-clicking on the component in the scene graph. To pop-up a small documentation of a scene, when loaded in Sofa, you need to create a .html file, with the same name as your .scn file. An example can be found for examples/Demos/chainHybridNoGroup.scn.